The skilled experts at Star Home Remodeling have been helping homeowners in and around the Plano, Texas, area customize their residences since 2007. Our commitment to our customers and to providing professional renovations has helped us become the area’s go-to bathroom contractors. In fact, our renovations have earned us a number of accolades throughout our years in business, including multiple Best of Houzz awards. We can even install premium walk-in tubs, which are fantastic upgrades for those with limited ability or for those who want to remain in their home as they age. Unlike traditional bathtubs, these products can be easily accessed without having to step over a high threshold. And, they boast a fantastic selection of additional safety features for enhanced peace of mind. 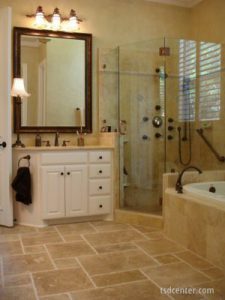 To learn more about why Star Home Remodeling stands out among other bathroom contractors in the Plano, TX, area, contact us today. We’ll be delighted to answer any questions you have and get you well on your way to enjoying the bathroom of your dreams.